Barrie appears to have started writing books whenever it was that people starting writing books, but even if he didn’t actually know Wynkyn de Worde personally, he became one of the senior statesmen of our angling writers and deservedly so. His output has increased at a logarithmic pace in his final years, with the result that I began to lose track of how many books he had published - not least because they cover an extraordinarily wide range of subjects. 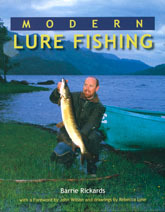 Selected recent highlights include a celebrated biography of Richard Walker, a book on Nile Perch fishing, and now, one hundred and fifty pages on lure fishing. While space precludes treating the subject in serious depth, Barrie nonetheless manages to cover all the ground and if you are beginning to look into lure fishing and have ended up in a head-spin trying to work out which bait does what and how to fish it, Modern Lure Fishing is a good way to get yourself re-orientated. While the majority of the text is about different classes of lures and species, there are useful sections on rods and reels, without any of the usual sponsorship-inspired guff; what you get is good advice, pure and simple. Contributors include James Holgate, Gordon Burton, Dave Steuart, David Bird and Fred J. Taylor and although the bulk of the book is about freshwater spinning, there are some very useful sections on saltwater and on big game fishing.